I continue my favourite top 10 weight exercises. I have been giving my opinion on some of the best weight exercises that I feel should be part of a gym staple for years to come. The purpose here is to show the benefit of having a good foundation, like old friends these exercises are something you can rely on to deliver the goods. Where do I start with the lunge? For me the lunge is a bit like an Bent-over row, something I have hated over the years and avoided doing because it never felt right, but recently have developed an appreciation for it’s purpose. Personally there is a great versatility to the lunge – it is challenging for the beginner purely as a body weight exercise (and is seen in many beginners workout plans). But then it can be made harder with weights. It also has the appeal for both genders – women who may not be athletic can appreciate it for the shapeliness it gives to the lower body. The trick with the lunge is to build up that technique and you will feel all the muscles in your legs working. To start with you might not be able step out far and lower down too much. But as you get better you will be stepping out wider with your leading leg, while the back leg is bending so that it is hovering slightly over the floor. This is why it is important to not go too heavy too quickly. Once you are comfortable with body weight use some dumbbells at the side or alternatively with a bar. The bar I find much harder – a greater range of balance is needed, therefore when I use the bar I always do it a bit lighter than I would with dumbbells. Another great variation for balance is a lunge on a bench. Hold the lunge position and use the leading leg to dip down – because you are not going back up to standing position this will burn! Other variations are in the range of motion. 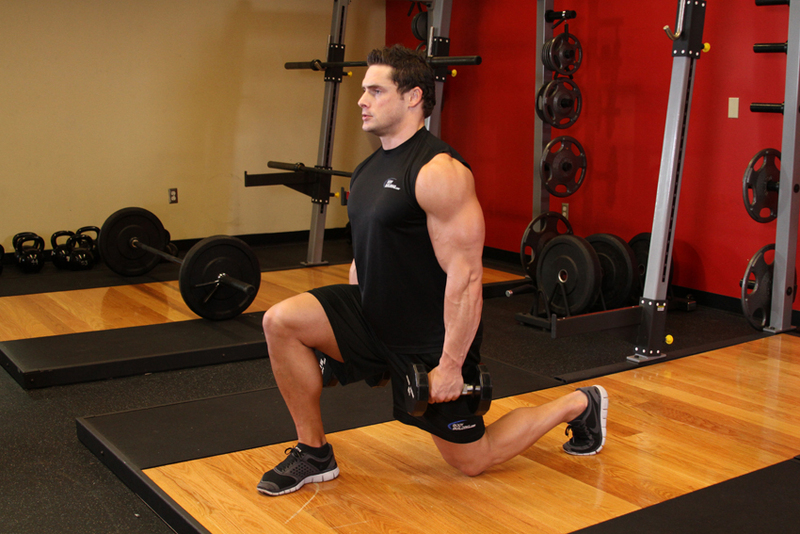 Traditionally the lunge is a step forward, but there are also alternatives where a step back is made. Bodybuilding.com – The 1 Exercise you should never do and 5 you should do all the time! Hey James thanks for the reminder i forgot to do this for a while. Lunges i like them for the stretch and for the leg strenghting.